Cryptocurrency- has NOT gone bang yet! It’s the same as all investments – intuitive investing – buying low and selling high. Cryptocurrencies are highly volatile. You should do some fundamental research into demand for the crypto-money. If you do you will understand the importance of some of the following issues. How many new cryptocurrency are being invented? What is their reputation? How many cryptocurrency have been hacked? Have people had their cryptocurrency wallets drained? Check how much greed v fear is present in the price? Check into why China disallowed cryptocurrency exchanges in China – could it be to protect its people and the value of its own (real) currency. The reality are 3 key issues which are very important – corruption, regulation and innovation. Corruption. This cryptocurrency market is full of corrupt operators. 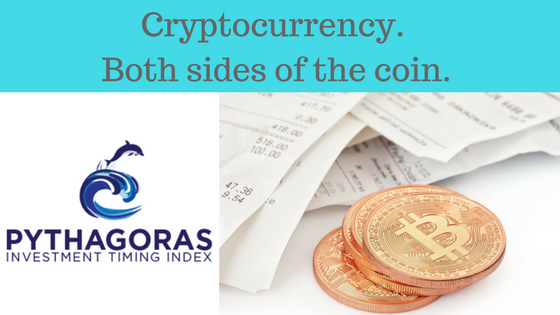 In the short term there is likely upside as more shady characters are attracted to deal further in cryptocurrencies. Given the anonymity they can easily lurk and prey on unsuspecting individuals. We expect this criminal activity will rise as the opportunity for abuse becomes more widespread. We expect that Australia’s AUSTRAC will be tasked with keeping an eye on trading to try to stop cryptocurrencies from being used for money laundering and financing terrorism. Regulation. Well, there is no regulation. Manipulation will continue to occur in the absence of regulation. We expect governments will attempt to impose regulation to curb this. This must reduce demand for crypto-money. How long before there is legislation that will force cryptocurrency exchanges to disclose details of investors and transactions. Innovation. The longer this price rise of cryptocurrency goes on, the greater the risk they poses to themselves. We see more technology being created in the cryptocurrency space – and with this, a higher risk of people being ripped off. There will be more competitors where there really have been few to date. Mostly the world has one currency per country. But with virtual currencies – the sky is the limit. Soon we will have a market full of such currencies, some of which will be literally set up for cheating the system. There are now more than 1,400 cryptocurrencies being traded in an increasingly crowded space. Our paper on Early Indicators of the GFC showed when you boil it all down, it was greed and the escalation of greed which was the root cause of the GFC. Tick off point 2, 3 and 8. This price bubble is only surface deep. Whilst there may be money to be made near term, in the medium term we see the punter being bitten by craftier and cleverer people. Every generation has one big event which is sent to relieve them of their hard earned cash – it appears the current generations is cryptocurrency! Normally people are used to a financial system with regulation. Psychologically they are being drawn into being invested in cryptocurrency. But the truth is they are lambs to the slaughter. There may be more upside in cryptocurrency but its a punt not an investment. If you want to gamble, better to go to the casino – the odds are better! So, the only question is – will you be there when it goes bang?